Note: Registration is now closed for this event, stay tuned for our next retreat! Join us for an immersive retreat into the ancient wisdom of Yoga and Ayurveda. The adventure is designed to reconnect you with your own inner wisdom through a journey of food, breath, movement, sound, ceremony and local culture. 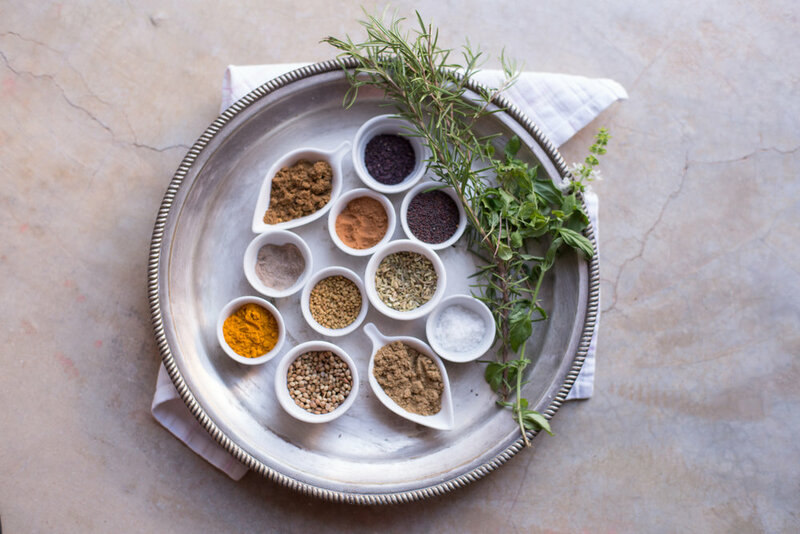 Each day is centered around an experience of the five elements and their corresponding senses, immersing you into the heart of Ayurveda with the spirit of New Mexico. How do you take a vast body of knowledge like Ayurveda and turn it into a living experience? Our Inner Wisdom Retreat is designed to take you into an immersive process of uncovering the elements in your own life and creating spaces where you can embody this wisdom in daily practice. Each day we guide you through reflective journaling, meditation, movement, sensory experiences and self-care that connects you to the elements within and around you. This isn't your typical retreat menu. We see food as the foundation of our wellbeing and pride ourselves on the intentional details that go into each handmade meal at our retreats. Our aim is to provide nourishment prepared with an attitude of love and reverence, in alignment with the seasons and the local environment. Our plant-focused menus use organic and locally-sourced ingredients, that are fresh and alive - nothing ever frozen or from a can. 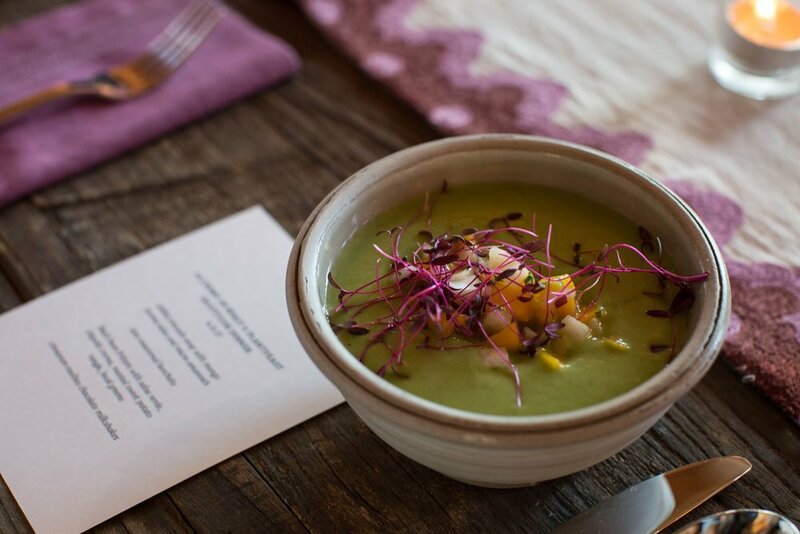 This retreat, we are lucky to have Dillon Tisdel of Oh, Holy Basil sharing her magic in the kitchen. Whether you're new to yoga or a seasoned practitioner, our daily classes are designed to integrate fluid movement, alignment focus, breath awareness, meditation, mudras and mantra that are all centered around the five elements and doshas. No previous experience required, we offer variations for every experience level. We also provide private yoga therapy sessions during the retreat for those looking to boost their personal practice or navigate healing an injury. We’ve curated a series of interactive workshops and ceremonial spaces to immerse you into the experience of Ayurveda through the elements, six tastes and their corresponding senses. Explore the vibrant farmer’s market and dive into the tastes of the southwest in a hands-on cooking class. Sit in silence with the wisdom of the water element in a traditional tea ceremony. Bathe in the mineral springs at Ojo Caliente and learn abhyanga, the art of nourishing self-care. Experience the wisdom of the Vedic fire ceremony, Agni Hotra. Rest & reset with evening Yoga Nidra. Located on the edge of town in a quiet, pastoral setting, Casa Gallina’s five adobe casitas provide an authentic Taos experience and cozy nest for our retreat. Each casita is decorated and appointed with furniture, art, antiques and textiles from New Mexico and Old Mexico from the owner’s travels. Take an afternoon nap in an outdoor hammock or cozy up to a wood burning kiva fireplace or wood burning stove as you drift away under the starlit night sky. Breathtaking views of the Sangre de Cristo Mountains set the backdrop for our retreat, while dreamy desert sunsets and moonrises illuminate our daily yoga and meditation practice. Explore Casa Gallina in a 360 virtual tour here. Three bedroom / two bathroom traditional old adobe home with private courtyard garden, view this room. Two bedroom / two bathroom adobe casita with a full country kitchen & wood-burning stove, view this room. One bedroom large studio casita with kiva fireplace for total privacy and sanctuary, view this private casita. One bedroom two-story historic casita with private bathroom, roof deck & kiva fireplace, view this private casita. Private casita with kitchen, king sized bed and private bathroom. Note: These rates include your room, all meals, workshops, listed excursions, gift bags and other goodies during the retreat. This rate does not include airfare or other travel expenses in getting to the retreat center. “Single” rates means a room all to yourself, “Double” rates are for two friends/partners traveling together who would like to share a room and queen sized bed, priced per traveler. Are you local and want to join the retreat? Traveling nearby and want to join our experience for the weekend? We offer a discounted local rate to attend the full retreat while staying offsite. This option is also available both for locals and for those looking to book their own accommodations nearby but attend the full retreat. Ready to join us in Taos? Complete the bookings form to select your room package and place your initial deposit. A $500 deposit is required to reserve your spot in this retreat. Full registration due by April 30, 2019.